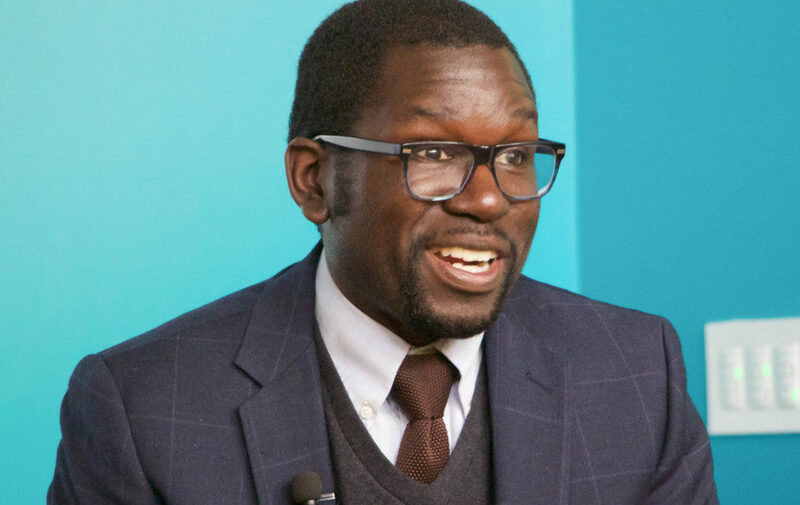 Jamelle Bouie is a New York Times opinion columnist and former chief political correspondent for Slate. He recently joined Vanessa A. Bee and Nathan J. Robinson to talk about what makes a strong candidate, the foreign policies of 2020 contenders, and different theories of building power. 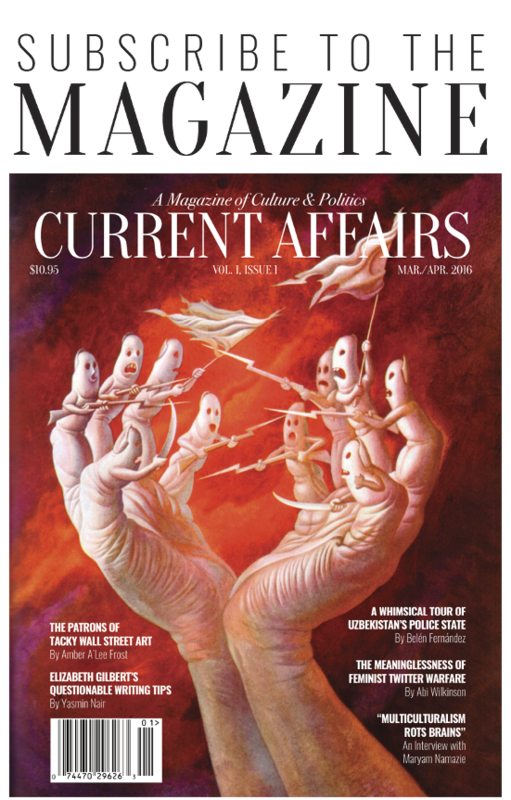 An audio version of the interview can be heard on the Current Affairs podcast. NATHAN J. ROBINSON: Are you dreading this upcoming election, or are you kind of excited? JAMELLE BOUIE: I’m neither. My emotional state neither gets that high nor that low, so I am just kind of interested to see how it will all shake out. There hasn’t been a Democratic primary like this in some time. 2008 was not like this. 2004 wasn’t even really like this. This is kind of akin to ’92, when you had a host of very well qualified, very serious candidates all vying from different positions from within the party. I’m 31, so for someone my age, it’s still very novel, and to the extent that I’m excited, it’s just to see how it all plays out. NJR: You must be the calmest person in America right now. JB: Maybe, I hope not. That sounds very bad, if I’m the calmest person in America. VANESSA A. BEE: Well, I’m curious. I don’t think I was as calm as you were in 2016. 2016 and 2015 felt very fraught to me, and there was just so much tension between Hillary supporters, and Bernie supporters, and people who were excited about neither. Some of my friends have warmly referred to that period as “hell-on-earth.” So, I’m curious in terms of how do you think your 2019 will compare to your 2015? Do you plan to approach the selection differently, whether as a public commentator, in your private capacity, than you did the last election? JB: Actually, I haven’t given this a terrible amount of thought yet, but if I’m thinking about it right now, 2015-2016, 2016 especially, well there’s two things happening: the first is that I’m just in a different kind of professional role than I was in 2015 and 2016. Then my job was to sort of, as best I could, cover and contextualize politics. When it came to elections, my principal goal was always to say: “This is what I think is happening, and these are the dynamics behind it.” And I’m still going to do that. But I do feel a little bit more freedom in my new job to kind of be more forthright about what I actually think about things, what outcomes I’d like to see happen. And I think reflecting on my 2015 and 2016 coverage, aside from the big obvious thing of, “Hey I didn’t think Trump would win.” I was actually kind of emphatic about the fact that he wouldn’t win, so I fucked up. VAB: We all did. As you mentioned, 2020 is shaping up to look a lot more like ’92 than 2016. We have such a large field of Democratic candidates, and so that sense of inevitability that seemed to surround so much of Clinton’s campaign three years ago just isn’t quite there this year, or at least I’m not seeing it yet. And I think that in a sense we could look at the larger field and say “Well, that’s a sign that we have a healthy democracy, and the system is working as it should. We should have a ton of candidates.” But at the same time, in seeing how that worked out for Republicans three years ago, it basically had the effect of propelling Donald Trump to becoming the right-wing nominee, which a lot of Republicans were not happy about. So I’d love to get your thoughts on what we should make of the size of the Democratic field this year. Is that a good thing? Should people be pressured to drop out? What do you think? JB: I’ll say just to start, I think that there’s a major distinction between how the Democrats’ large field is going to work out versus the Republicans. And that is, on the Republican side, you had two things that were—and let me pause here, add a parenthetical: Political scientists believe that a variety of pressures from party actors, from voters, from elites, from activists, work in concert to thin the field ahead of actual voting. So by the end of this year, according to this model, if there are 20 candidates to start, then by the end of the year, maybe there will only be 12 or 11 or 10, or even nine or eight. And this is sort of a feedback process between candidates’ campaigns and everyone else within the system. In 2015, with the Republicans, this kind of worked, and you saw that with, say, Scott Walker, who dropped out pretty early. It kind of worked in 2012 with a candidate like Tim Pawlenty, who dropped out pretty early. But in both election years, there were things that sort of sabotaged—sabotaged isn’t the word I’m looking for, but I can’t think of a better word—sabotaged that winnowing process. So in 2015 you had this big Republican field, and unlike this year’s Democratic field, you didn’t have any resource constraints for the candidates. For say, Ted Cruz, or Jeb Bush—especially Jeb Bush, but for basically everyone in the field—they could run their campaigns not by soliciting donations from ordinary people, or even from kind of interest groups or whatever, but just by billionaire sugar daddies. Everyone had their own über-rich person who would just, using a super PAC or whatever, shovel money into the campaigns. This is actually really terrible if you’re trying to winnow down a field, because the candidates aren’t receiving a really critical feedback mechanism. They aren’t receiving something that will tell them in real time that “I’m not catching fire. I can’t raise enough money from actual voters, or from supporters, so that’s a sign that I’m just not doing really well.” Instead, no matter how poorly they did in an election, no matter how poorly they are polling, they could always say, “Well, if I just hang on a little longer, I can make headway, I can make ground, and I can maybe even become the nominee.” So the mere presence of just billionaires openly supporting candidates in the Republican primary was one of the key conditions to let someone like Trump win, because the other thing that was happening was the pressure that voters were responding to wasn’t the candidates so much as it was conservative media and then mainstream media giving a bunch of attention to Trump. The two in concert were sort of giving Trump this ability to monopolize the conversation constantly. So you have Trump monopolizing the conversation, this hugely influencing voters, putting him in their central mind’s eye, at all times. And then a critical feedback mechanism just did not exist. Jeb Bush had raised something like 50 million dollars within a couple months of entering the race. Jeb Bush had no popular support. But Jeb Bush could say, well, I’m the third Bush son, I’m the kind of thing who usually does well on these things. So even without any real voters behind me, if I can just stick it out ’til Iowa or New Hampshire or whatever, then I can survive. This more than anything made it difficult for Republicans to just consolidate behind a not-Trump and win. Democrats don’t have this problem. There just aren’t very many billionaires eager to give money to any Democrats, and those that might are mulling actual runs for president, so that’s its own thing. There is an emerging norm among Democrats against taking certain sources of money. And I have to imagine that this would likely include the über-rich as well, and just as a general thing, Democrats are much more reliant on grassroots fundraising. And in the wake of Sanders’ 2016 run, this was especially the case. Sanders and subsequent candidates in statewide elections have demonstrated the ability to raise huge amounts of money through small donations. And this has both pressured other candidates to reject corporate super PAC money, and also given them reasons to start building up their own capacity to do this. So I think one takeaway from these developments in fundraising, and the dynamic of fundraising on the Democratic side is that it’s going to be difficult to raise the money if you are, I don’t know, Julián Castro, or if you are even Cory Booker. It’s going to be a little bit harder to raise the money to stay in throughout the entire way. And so I actually think that that alone is going to shrink the size of the field. It’s looking big now, but I wouldn’t be surprised if by Iowa, there’s maybe eight or nine people running, versus 11, or 12, or 14 or 15. VAB: I wish that Cory Booker had more confidence in himself. I mean, my politics personally don’t necessarily align with his, but that’s a person who I would imagine… he’s very appealing personally. It seems to me he’s saving kittens from burning buildings every other week. He is someone that people are drawn to. So I find it a little surprising that he has relied on super PAC money for so long. I think that’s actually someone who could raise a large number of small donations, if he committed to it. Again, I wonder what he’ll do this round. JB: It’ll be interesting, because if he is reliant upon super PAC money for his campaign, this will probably end up being a voting issue for some voters. And even if it’s only an eight or nine person field, that’s still a lot of competition, and things like that can matter. So my read at this stage is that the big Democratic field isn’t going to be as big as we think it’s going to be, by the time voting actually begins. And I think, all things equal, it is good for a political party to have so many different people vying for this office, for them to reflect different ideas about governance, and reflect different ideas about not just policy, and ideology, but literally “How does one make political change happen?” I think it’s good that all of that is in the mix. The unfortunate confluence of “stan” culture in politics is going to make it insufferable. NJR: What culture? Could you explain that to our elder readers? JB: Stan culture, so people treating politicians as if they’re celebrities to be fans of, and not like people asking to be given massive amounts of power over one’s life. NJR: Though it does seem as if, so far, we’re having a little more of a policy-focused primary in a way that’s somewhat encouraging. I do wonder, though, when you look out at the long stretch we have ahead of us… someone pointed out to me recently that you could conceive a child, undergo a pregnancy, have the child, conceive another child, undergo that pregnancy, and then have that child, all before Election Day in 2020. That’s how long we have ahead of us. So I guess, what are the limits of what we can know at this point? Are we looking at a situation that is just so different from what is going to unfold in six months, or nine months that it’s not worth tracking who’s up, who’s down at this point, or are there things that we can be relatively confident about? JB: I think tracking who’s up, who’s down is probably a fool’s errand at this point, because most people are not paying attention, even most primary voters, or most potential primary voters. So all of this is kind of inside baseball for people like us, and there is a lot that can change in a year that can make or break candidates. I always just think of 2007 when, for most of that year, Barack Obama just seemed like he was going to flail in a marquee race between Hillary Clinton and John Edwards, and that’s obviously not what happened. But there are things that we can pay attention to in this period that might help us understand and even project what might happen in 2020, when voting actually begins. Those are things like “Who is hiring who?” or “What does the staffing situation look like?” The fact that Bernie Sanders or Kamala Harris is picking up kind of top-tier staffers tells us quite a bit about how Democratic party elites understand at least the viability of either two candidates, their potential to win the primary. We can pay attention to where the candidates are spending most their time, where their organizations are strongest, which tells us about their strategies. It’s clear that Harris, for instance, her strategy is really going to hinge on South Carolina, and on having a decisive win in South Carolina, and using her stature in California to sort of make up for any deficiencies in Iowa and New Hampshire. We can look at fundraising, like I said, if both Sanders, and Harris, and Warren for that matter can continue this relatively large amount of small dollar fundraising, that tells us something about where actual voters are in terms of who they’re excited about, who they want to see. Those things are what I think are going to be helpful to look at this year, and it won’t be until the end of the year when kind of the horse race stuff will really start to have any kind of weight to it. VAB: Were you at all surprised by the early endorsements that Kamala Harris picked up, like congresswoman Barbara Lee, and civil rights activist Dolores Huerta? JB: Not too much. I mean, her opening gambit has very clearly been a kind of shock-and-awe targeted towards as many competitors as she can manage, and so that includes fundraising, that includes rallies, with her Oakland rally of like 20,000 people, and then yeah, getting these endorsements from key California figures. I think for as much as people try to analyze political decisions ideologically, I think a lot of that is as much about the fact that Harris is a Californian, is sort of the first California Democrat with this kind of national stature since Jerry Brown in the ’90s, and stands a real chance of being, I want to say the first California Democrat to be president of the United States. Hometown loyalty really matters. Now on the opposite side, if you’re the Harris campaign, you’re going to spend a lot of time trying to lock down these big California endorsements, because if you don’t have them, if you lose the endorsements of these major figures, it sends a signal about your weakness to everybody else. I have no inside baseball about any of this, no details about what happened, but I have to imagine that most of last year, from the Harris people, as they began to really ramp up for the election, was really nailing down these endorsements and really making sure that Harris has either the support of much of the California Democratic establishment, or can at least get the silence of people who oppose her. VAB: Another difference we’re seeing between this year and the last election is just how incredibly diverse the slate of candidates is so far. But as you and I know, blackness is not a monolith, womanhood is not a monolith, and Kamala Harris and Cory Booker have very different records, as do Warren and Klobuchar, as do Biden and Sanders. So that sort of complicates the dynamic between candidates, and I think it complicates things for voters who value diversity on a representative level, but now have so many choices before them. And I wonder whether a Sanders nomination or a Warren nomination—people who we think have good politics, but who are white and older—whether their nominations would make sense for a left that is concerned with protecting the interests of non-privileged, non-white, non-cisgendered, non-heteronormative people who call America home. I’m curious, does it make sense for either of these people, for Bernie, or for Elizabeth Warren to be the nominee in this atmosphere, and what else could they do to reassure voters who might be concerned about their demographic? JB: That’s a good question. One of my priors about this election, and it’s sort of based off of the midterms, is that it’s clear to me that voters are very much looking for diversity. They’re looking for women candidates to elevate, and they’re looking for non-whites to elevate. That’s been the case in congressional elections, and statewide elections, and I have to imagine that’s also the case with the Democratic presidential primary. In that sort of framework, Warren hatched this advantage of being a woman and fulfilling that desire to elevate a woman candidate. But having said that, I don’t think this necessarily means Sanders or anybody else has a problem. I mean, we’ll recall that Joe Biden, who has not announced yet, is quite popular with Democratic primary voters, as far as the polls suggest. I think how that will actually shake out in voting if he runs is very different, but that’s what the polls say. I’m glad you said that black voters and women voters aren’t a monolith, because I think there’s some confusion about the dynamic for 2016. My own view is that in 2016, if Bernie Sanders had announced, and immediately spent a bunch of time in South Carolina and Georgia, and kind of built his campaign out from there, I think he would have stood a pretty good chance of winning the nomination. Straight up. To the extent that he has any weakness with African American voters in the Democratic primary, it has less to do with his views and more to do with just basic familiarity between the candidate and the public, as well as something that I call his “strong Democrat problem,” which is that if you were to break down the 2016 electorate into three buckets, you’d have Strong Democrats, people who strongly identify with the party, Weak Democrats, people who generally vote for Democrats and participate in primaries, but depending on how they feel, they may not identify with the party, and then Democratic-leaning Independents, who are people who generally vote Democrat but not always, but don’t really identify with the party. And Sanders did great with Democratic-leaning Independents, very good with Weak Democrats, and then very poorly with Strong Democrats. And if you were to distribute the black vote into those buckets, black voters, most of them, would fall into the Strong Democrat bucket, some of them into the weak, and very few of them into the Democratic-leaning Independents. And if you were to break that down by age, pretty much everyone older than 30 is in the strong Democrat bucket, and everyone younger is in one of the two other buckets. If you just zero out the blackness here, and just try to look at who is strong, weak, or independent, Sanders did really well with Weak black Democrats, and black Democratic-leaning Independents. And so his challenge for this year is to kind of expand into this category of black people who identify somewhat strongly with the Democratic Party within the primary. And I think he can do that. I don’t think there’s anything inherent to him that makes that difficult, it’s just a matter of time and effort. And if he is nominated, even with this desire among voters to elevate women and non-whites, I think that there are ways that he can win the nomination, and still kind of fulfill that. That’s going to mean, more or less, choosing a running mate who is not white, and not a male. It’s clear to me that what’s driving Democrats this time around, for all these other concerns, is they just want to beat Trump. And they’re going to nominate whoever they think can beat Trump. So if it comes down to it, if it’s March and past Super Tuesday, and it looks like Bernie Sanders is the one who can beat Trump, and Democratic primary voters are coming around to that view, they’ll probably be pretty likely to nominate him, and they’ll figure out the representational stuff. And Sanders, just observing his early campaign thus far, he and his team are aware of the representational stuff, so they themselves are taking an affirmative effort to deal with this. NJR: You recently wrote a column that pointed out an interesting thing about Bernie Sanders that I don’t think has been noted anywhere else. You pointed out that he has this odd advantage in foreign policy, because other candidates in the Democratic primary haven’t really staked out strong foreign policy positions. In 2016 he was seen, versus Hillary Clinton, as someone who had less foreign policy experience. But bizarrely, and somewhat unexpectedly, in 2020 he almost could pitch himself as the foreign policy guy, because since then he has done a number of things, including a Senate resolution on Yemen and a couple of speeches in which he’s laid out a pretty clear vision for how America should interact with the rest of the world. JB: It is kind of unexpected that out of this very big field, two things are true. First, there just isn’t that much foreign policy thinking on display. And I understand that—I think that American politics these past few years has been very focused on the domestic. But it’s the case that where the president has the most authority—not authority, necessarily, but at least the most flexibility and ability to act—is in foreign policy. The inertia in Washington toward certain options is so heavy that it’s important if you are trying to work your will as president to have a well-defined vision. And so far, the two candidates who have even attempted to put one forth are Sanders and Elizabeth Warren, who unveiled a similar set of ideas late last year. And I’m probably engaging in a bit of pundit’s fallacy by saying that this is really going to matter. JB: That your preferences reflect what voters actually want. VAB: And to be fair, even though Bernie Sanders got criticized a lot in 2016 for his lack of foreign policy experience, he still, during the debates, expressed opinions on foreign policy that did kind of go against the grain with the Democratic and the Republican establishment. I remember when he expressed mild support for the Sandinistas, and I remember that quote about how Henry Kissinger was “no friend of his.” And that got a great reception, maybe to the surprise of the Democratic establishment. But I think it is true, maybe, that the people at the head of the party have assumed for a long time that public is on board with the status quo, in terms of of the alliances with the rest of the world that the United States has made. You know, the way Sanders’ comments were received in 2016 I think challenged that a little. So I’m really excited to see whether he’ll be able to move that Overton Window this cycle. JB: Yeah, if anything, just making it part of the conversation forces other candidates to respond, and then you can get something. Even if voters don’t really care about it, you can get somewhat of a discussion among candidates about this. And that’s an important thing too. If, by the end of the primary—whoever is the nominee—if the foreign policy consensus among the candidates is to the left of where it was when it started, that matters for staffing, that matters for policy, that matters for how they act if they become president. One of my other priors is that what candidates say during primaries really does matter. Presidents try to fulfill things that they say as candidates. So actually, it’s very important to get them to commit to things as candidates, because it does guide or constrain their actions. A good example of this—although, I think, in the end, it was not great for his presidency—is how Barack Obama’s gestures towards bipartisan unity constrained his actions as a president. They were part of why, I think, he attempted all of these bipartisan overtures. It was a thing he promised. Part of his campaign appeal to many voters was, “I will do this thing,” and it wasn’t until that was shown to be completely futile that he felt he had the political area to abandon it. NJR: A number of articles in the past couple of years have said that the Left is missing a coherent foreign policy vision. And you began to sketch out what you thought the basic principles would be on which such a vision could be developed, the first being do no harm. Don’t interfere in countries where your intervention is likely to cause ruin. But then, going beyond that, establishing a principle of support for social democratic governments around the world and a principle of opposition to authoritarianism and dictatorship. And what I liked about your column is that it began to get us towards thinking—not just in relation to Bernie Sanders, but for the whole left to start thinking, “Well, what are the basic principles on which we should build our ideas?” And I like those principles that you sketch out, but I wonder if you can go a little more into how you think that can be presented. JB: I think Warren and Sanders, as far as presentation goes, they do the thing that I would like to see the candidates do collectively, which is to sort of directly draw a connection between politics at home and politics abroad. They show Americans that it’s not just that we can’t be hypocritical, that we can’t talk about democracy, and then go and support regressive and authoritarian regimes because of some narrow conception of national interest. But it’s also that how we organize our society at home matters a great deal for how other countries are receptive to our ideas for how we act on the world stage. There needs to be continuity between the kinds of values we have at home and the kinds of values we express abroad, and the kinds of action we take abroad. Having both Warren and Sanders hitting hard that we need to build democracy at home, and use that as basis for expanding democratic participation in the world, is really important. I didn’t get into this in the column, because I couldn’t figure out a way to integrate it, but this is part of a long tradition of American thinking, that Americans from the beginning have understood one of the important values as demonstrating to the world that democratic government works, that democratic government is a moral good, and that meant protecting it and safeguarding it at home. Where I think more work needs to be done in terms of serious thinking is that even if you take this approach as your organizing principle, and you’re able to use it for addressing relatively easy cases—like Saudi Arabia, or the Gulf states broadly, Russia, like authoritarian states, or like budding authoritarian states like Hungary, or what have you—it still remains the case that the United States is an imperial power with a massive military presence around the world, so how does a liberal or left wing government deal with that fact, deal with the fact that there are a dozen carrier military groups across the world, hundreds of military bases, tens of thousands of troops deployed everywhere? What does one make of the fact that in places where the United States is trying to expand its influence, or maybe trying to extend, or protect democratic governments, or stand against autocracy, there are rival powers trying to do the reverse? What does one do about the fact that you have this big authoritarian country called China that is a major player on the world stage, and very jealous about its sphere of influence? What does the United States do about that? I think Sanders and Warren have put out really great principles and guidelines for action, but I don’t have answers to this. There was a time in my life where I was really into foreign policy. It’s less so these days. I’m kind of an observer. But I think these are real concerns for developing a foreign policy, because there is no other left-wing, liberal, whatever, movement or party in the world that faces this particular question of, “Hey, we are at the head of what is the largest and arguably most advanced military to ever exist with a presence around the entire globe.” So how does one manage that, and what are the responsibilities that come with that? VAB: This ties in a bit to another column that you wrote that I really enjoyed, titled “The Biden Fallacy,” in which you drew a contrast between candidates who confront power and candidates who accommodate it. And I think that’s important in the realm of foreign policy, as much as in the realm of domestic politics. It’s a really helpful metric for voters who may find themselves, a few months from now, still overwhelmed by the amount of choice on the menu this time around. But I was hoping that you could perhaps elaborate a bit what you mean when you reference candidates who take on power, versus candidates who kind of strive to accommodate it? JB: Sure. The question I was trying to answer is, “What does moderation mean in context?” Because there are a number of candidates who are being referred to as “moderates.” Joe Biden, moderate… Howard Schultz—if he runs—independent, moderate, calling for moderation. And it was just unclear. The word was being tossed around, but it was unclear what it actually meant. So from my view, what it appears to mean is something less about policy. Policy plays a part. And the two things are connected, so it’s not as if these are two separate spheres. They overlap, and they’re connected, and they weigh on each other. But what it seems to signify is just a basic orientation towards the political system itself, which is that the moderate candidates appear to believe that it is possible to build some kind of elite consensus about what to do, and turn that into public policy. So someone like Michael Bloomberg clearly believes that there’s enough good will among American elites that you can get a solution on guns that would satisfy everyone. Joe Biden clearly believes that there’s enough good will among American elites that you can get a consensus on economic mobility and opportunity, that corporations and business recognize that it’s in their best interest that to do X. Voters want X, politicians can negotiate X, we can all come together and put something together. This is something that, if you’re going to describe Barack Obama as a moderate, this is what makes him a moderate, a very kind of consensus-oriented view towards crafting policy. NJR: So to be clear, you think that one of these two visions of politics is far more realistic an understanding of power than the other. You call your column “The Biden Fallacy” because you suggest that Joe Biden, with his lack of a confrontational politics, is basically committing a fallacy. You quote Anna Julia Cooper saying that progressive peace in a nation is a result of conflict, and conflict as healthy, stimulating, and progressive is produced through the existence of radically opposing elements. Then you comment on that and say “antagonism, indignation, and anger, they don’t diminish democracy or impede progress, but are a inescapable part of political life in a diverse and pluralistic society, and necessary for challenging inequalities of power, wealth, and opportunity.” So I take it you really feel one of these visions is almost delusional, or naive, and that probably people should be leaning toward candidates who have that better understanding of what it takes to actually make progress in a society of conflicting interests. JB: Right, if your political commitments lean towards wanting to see some sort of — even just substantial redistribution, not even kind of of political and economic power, but you just want to see a big child care program, or healthcare program, or housing program, then I think that you are someone who should want to vote for a candidate who at least demonstrates the awareness that there are political enemies. That there are people who—I mean, maybe their opposition is good faith, I don’t know—but who have fundamentally different interests than you, and that they’re not going to concede them unless they are in danger of having those interests eroded in a serious way. So, yeah, in my view, the two candidates who have a theory of political change that actually deals with power are Elizabeth Warren and Bernie Sanders. That may change as the election continues on. But I think if you’re someone who does want the United States to take a step towards more social democratic government, then your options are actually pretty limited. Having said that, I also think that ultimately what is going to matter most in terms of any future Democratic presidency is actually like the social facts on the ground. If there are organized movements to pressure politicians in a particular direction, those are really going to matter. NJR: That’s an important point. We talk a lot about the policies put forward by presidential candidates, who is better to advance a certain agenda, but as you mentioned here, there’s so much more than the presidency. We’re going to end up talking a lot about the presidency over the course of the next 18 months. But we should probably also be looking at the development of movements, and state politics and congressional politics too. What would you say people should be sure not to take their eye off? JB: So a good example is: I live in Charlottesville, Virginia, and Virginia has its state legislative elections in the fall. So the House of Delegates and the Virginia State Senate seats will be up, and whoever wins control of the General Assembly in the fall will have control over redistricting, will have the ability to draw the maps, both for state legislative races and for congressional races for the next 10 years. That is significant, right? That’s the difference between Virginia—which at this point is like a 52-53 Democratic state—that’s the difference between Virginia sending eight or nine Democratic congresspeople to the House, versus four or five. And that, in turn, is the difference between the median Democratic House member from Virginia being someone like Bobby Scott, versus it being someone like Elaine Luria, from a conservative part of the state, Hampton Roads. So multiply that by 50, these are the things that are really going to have a big impact on a future Democratic presidency. Not just in this very hard numbers way of who is determining the districts, how many Democrats are actually getting elected, but the perception of where the public is in relation to that president’s agenda. Barack Obama, to use the last Democratic president as an example, was constrained by the fact that he had these big losses in the states. They didn’t necessarily immediately matter for his agenda, but they sent sort of a signal to the broader political system that this liberalism was anathema to the American public. And that’s important too, right? That’s part of the messaging war as well. So as we move into this presidential season, not only should we be paying attention to all kinds of down-ballot races, not only should we be paying attention to new movements of organized workers or new protest movements, but we should also be paying attention to how the actual candidates respond to and understand those movements. Are they encouraging of them? Do they talk about them? Do they talk about helping the various Democratic campaign committees, whether the DLCC, or the DSCC, or—there’s one for state races that I can never remember the alphabet soup name for it. But whether they’re talking about having a political operation that exists through their presidency and works to bolster its ability to win seats and make gains. Because all that stuff is going to be critical. There is no New Deal without the 1934 Midterm Elections. There is no Great Society without the 1966 Midterm Elections. All that stuff is going to be vital. Interview transcribed by Addison Kane. Photo courtesy of New America.